How many wedding vendors does it take to build the perfect day? 2018 is off to a busy start, highlighted by my daughter, Abigail’s, wedding on February 10th. I’ve found that most multi-vendor complex solutions (e.g. weddings) follow a path of discovery through a series of trusted referrals, leading from one vendor link to the next in the value chain. Given the heightened expectations of planning a wedding and the “must not fail” mentality for the chain of vendors involved, I asked Abigail to blog about her journey planning her perfect day. She is an amazing planner, and after helping me write my blog since 2016, she’s gained a keen eye for great or flat CX– Enjoy! I recently married my partner of nearly nine years, and my dad asked me to write about the process of planning a wedding in 2018. Like so many girls, I spent years thinking about what I wanted my wedding to be, and let me tell you, the real thing was so much better. Looking at this from a CX standpoint, I found the most important part of planning a wedding was getting all the vendors lined up and on the same page as my vision. Trying to connect these vendor dots, I broke down my search into four areas: marketing, sales, service, and referral. I’m sure you know the pressure trying to get everyone in a room to see your vision. The first vendor my husband, Michael, and I found was a website focused on wedding planning called “The Knot.” This one-stop-shop led us to find our venue, the first link in our chain of vendors. We both love pop culture, movies, books, and pretty much anything nerdy, so we wanted something offbeat. Through The Knot’s database and references we found the perfect place: our local Science Center. 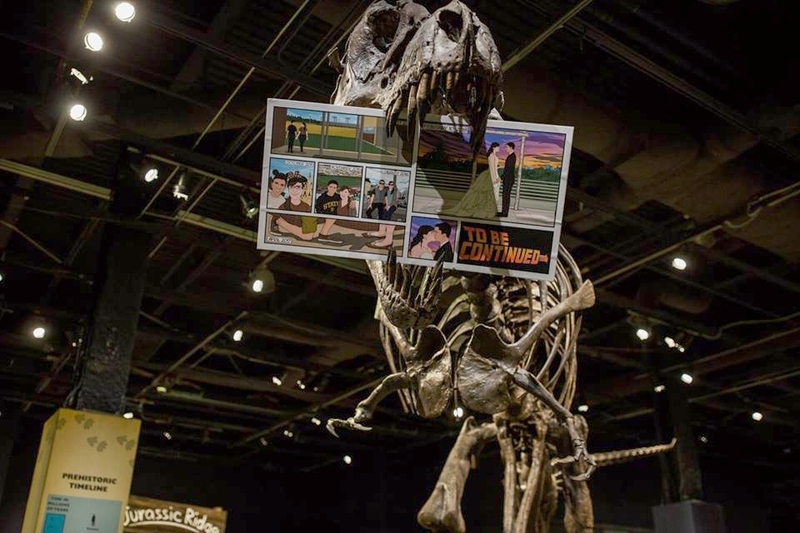 It had the outdoor ceremony space I wanted, the indoor reception space Michael wanted, plus a giant T-Rex skeleton that holds a sign in its mouth. When we did a tour, their event planning team was genuinely nice and helpful. Their marketing sold us on the space by walking through the day-of aspects like where to get ready, photo opts, and how they set up and break down for each event. Our venue then provided recommendations for other vendors of every category and only required that we use one of their fifteen approved caterers. The venue heard my vision and became the central point for the rest of our planning. Abiding by their list we met with two caterers, and while price points and food selection impacted our decision-making, their services included and sale’s pitches weren’t as important as in traditional marketing. For us, it came down to their customer experience, and how they did or did not embrace our vision. The first caterer made us feel trapped; as if they were trying to sell us on what they thought should be served at a wedding, worse yet, there was no tasting; that was only for serious customers. The second caterer was more inviting. There was a tasting first thing, and she left us alone to try the food and talk about it. She made me feel comfortable, and more than anything these simple services made our decision for us. Our venue also helped us find our photographer. I always knew I wanted two photographers. Being a highly nostalgic person and pretty handy with a camera myself, it was important that every aspect of the day be captured. By browsing the venue’s Flickr account, we found a couple that had shot at the location before and had a style we loved. When we visited their website for further research, we found that besides beautiful photos, the couple also kept a blog about different weddings they had done. Each couple was written about with excitement and love. This simple, honest marketing captured us. On top of that, their services included all day shooting plus an engagement session. We scheduled our engagement photos, during which, they made us feel as though our love story was the only one they cared about. The vendors who shined for us were the ones who made us think we were their number one priority. Their services were focused on understanding our vision and working together to make it become a reality. Understanding the importance of the moment for your customer, and marketing the emotion with deeply personalized experience is a formula for success. Besides looking to our venue or The Knot for referrals, we also asked friends and family what made their weddings special. Our florist was discovered through a friend, our band was headed by a family friend, I bought my dress at the same boutique as my step-sister, and my hair and make-up were done by people I had known in high school. A company can use marketing and sales to get your attention, but especially when it comes to the wedding industry, everyone is looking for those five-star ratings from people they trust. Through these trusted opinions, a smaller bridal boutique can complete with the Goliath of David’s Bridal. We looked for vendors who understood our vision, worked to make their piece perfect, and then found other vendors who could enhance that vision. As the second biggest link in our wedding vendor value chain, the Science Center leveraged its connections and experience to help connect the dots in our planning. The way in which our florist treated our friends or our photographers displayed their love for what they do, demonstrated natural, organic marketing strategies that show humanity in their business. That’s all any client can ask for when hiring a company– humanity. It needs to shine through every aspect of a brand’s CX touch points, including marketing and sales. To complete our CX lifecycle, I filled out reviews for all my vendors on The Knot. You, and everyone else starting their wedding planning journey, can see my wedding vendor referrals located in Orlando, FL.